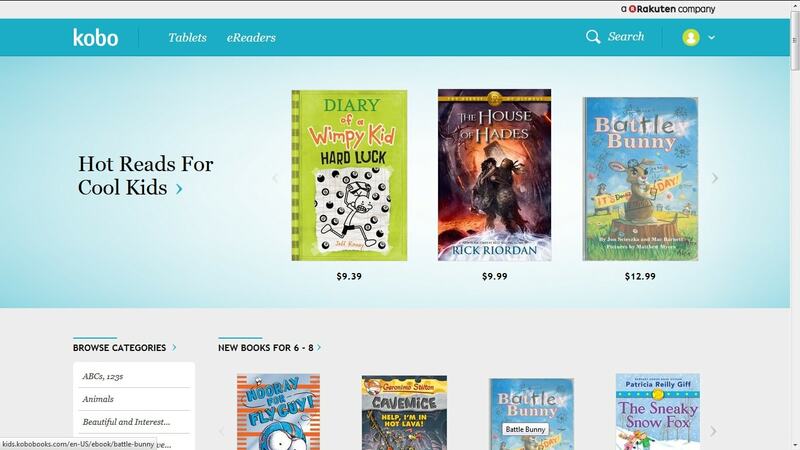 When Kobo launched their new gadgets in late August they also promised that they were working on a kid-friendly ebookstore that would enable parents to control how much their kids spent and what content their kids could see. It's been 2 months since that announcement with nary a peep out of Kobo, but today I learned that the Kobo Kid's Store has just launched. Kobo announced the launch in an email circular today, and I found out at MobileRead. Update: The new Kid's Store actually went live close to a month ago, but I don't think anyone noticed. The new section is live, and I went hands on. All in all, it's rather useful but it could still use a lot of work. Parents can now go into their "My Account" page and set up a subordinate account for their kid. That subordinate account is restricted to accessing only the kid-safe section of Kobo eBookstore. This unfortunately also cuts off a lot of otherwise safe content that wasn't specifically published for kids, but I guess you cannot have everything. A kid's account has only limited access to funds, so parents won't have to worry about a £4,000 shopping spree. Funds have to be doled out by the parent in increments of $10 to $25, and if the kid's account runs out of money they won't be able to buy anything (thank god). I still have nightmares of my younger brother running up $500 cellphone bills so I am pleased that Kobo has gotten the finances right. And given the recent blowup over erotica in the Kobo, Kindle, and other ebookstores, it's good to know that Kobo is offering a kid-safe solution. But it's not perfect - not even close. To be more exact, the general account management features leave a lot to be desired. For example, there's no way for the parent account and the kid account to share an ebook. Instead you have to buy a second copy. That is frankly ridiculous; in my house we only bought one paper copy of the Harry Potter series and then shared them. I don't see why we shouldn't expect to do the same with ebooks. There's also no way for a parent account to gift an ebook to the kid's account, which presents an entirely separate problem. There is an awful lot of content in the main section of the Kobo eBookstore that is perfectly safe for kids, and I know that I would want (as a hypothetical parent) to be able to grant access to certain titles which I had bought in the Kobo ebookstore. Furthermore, the content limitations are going to cause some merry fun with assigned reading in high school. There are any number of adult titles that are assigned reading (Catcher in the Rye, for example) that a kid's account cannot access. In conclusion, I think this is a good first step for Kobo. It will indeed keep kids safe, but only at the expense of stifling the advanced reading skills of teenagers and pretty much everyone else who reads above their grade level. It's all well and good to protect kids, but if the protection also stifles growth then it comes at too high of a price. P.S. I, for one, read on an adult level in the 7th grade. In the 8th grade I did book reports on Metamorphosis, The Elephant Man, and The Scarlet Letter - 3 titles which Kobo is very careful to protect kids from. When you buy an ebook you are buying a non-transferable license (tied to the account that bought the book). In this case it appears the child account is really a separate account, managed by the parent account. If Kobo would allow sharing of books between two accounts, they probably would get in trouble with the publishers. On the other hand B&N’s profiles (on the HD tablets) are just different views of the same account, so no problem adding one book to multiple profiles. That is probably how Kobo set things up, but here’s the point that you and they missed. Both accounts are controlled by the parent. The kid doesn’t agree to the TOU so the parent owns the ebooks in both accounts. That means there is really no good reason not to consider the accounts as a compound account belonging to a single person. But what about when the kid grows up? I imagine there’s some way to convert a kid’s account to an adult account. So actually Geert is likely correct here. These are seperate accounts and therefore books cannot be shared between them. It’s no different then if you and your significant other have seperate accounts. Or for that matter if you open 2 accounts (I don’t know if this is allowed in the TOS). Seperate accounts, seperate ebooks. If it’s still confusing for you, in many countries a guardian or other party can open a bank account on behalf of their child. The child usually has limited ability to withdraw money from that account, the guardian often has complete ability (although it depends a lot on local law and the account, and if a dispute arises between the guardian and the best interest of the child, there’s no guarantee the guardian is going to win). But there’s no question these are seperate accounts. The guardian doesn’t complain when their account balance doesn’t show the amount in the child’s account. And when the child grows up, the account is theirs. Really the problem seems to be that at least according to you, there’s no way to have a kid’s profile in an adult account. So people are forced to have a kids account rather than letting their kid use their account but with limitations. But that’s largely a seperate issue from the existance of a kid’s account and the resulting effects thereof. And it’s not like the Kobo case is something rare. I imagine many people deal with similar issues each day. Consider what I hinted earlier and partners who share an Android/iOS/Microsoft/Kobo/Amazon/B&N/whatever account and break up. Or for that matter when a child starts to grow up and sharing their parents account just doesn’t work any more. And let’s not forget that the device limits often mean big families, or families with lots of devices of the same type can’t use just one account anyway. The good news is devices are increasingly supporting multiple accounts in some fashion which helps with the sharing account issue. Each person keeps their own account, in the event of a breakup or kid growing up or whatever, they have to buy again the whatever to continue to have it. The non transferability still makes problems compared to what people expect with physical copies but it’s still generally better than one account ending up with all the stuff. As for those with lots of devices (whether big families or whatever) well, it’s perhaps not completely unresonable for them to buy multiple copies if they need it so many. Again it doesn’t quite tally with physical copies considering the relationship between the devices and accounts and people since you can’t mix and match the different copies of different whatevers. Still that’s DRM for you. The gifting would appear to be a problem. This would be the easiest way to get around filter issues when a child needs access to a book that has been blocked. As stated by Geert, I totally understand why ebooks can’t be passed around like paperbacks. It has long been accepted that when a consumer buys a paperback, they own the paper. They don’t own the content within. (It is copyrighted.) Since with ebooks the owner doesn’t own the content or the paper the only think left is the device. If a consumer wants to pass around their device, fine. But it is not the same thing for a consumer to pass around ebooks and paperbacks. Ebooks lack the obvious limitation of being in one place at one time. This is why there are so many issues with DRM, libraries and the such. As an author, I make my content non-DRM whenever I can. I tend to trust in the readers to compensate me for my labor as they see fit. If I sell an ebook for $2.99 and they love it, I would hope they would gift versions to others rather than simply passing on the digital 1’s and 0’s. But if they want to transfer it to a family member’s device for free, I understand that as well.